Looking for a fun adventure for your older elementary or middle school student? This book might just be what you’re looking for. Saving Mount Rushmore is the story of a middle school boy named John, who’s upset to have to spend the summer in South Dakota with an Aunt he barely knows. So much for the fun summer he’d hoped for, spent at the Jersey shore with his friends. Soon after he arrives at his Aunt’s ranch, Jon finds out that he’ll be part of a special program at St. Michael the Archangel School. Summer school? Really? This was a thoroughly enjoyable, fast-moving adventure with some very likable characters that provided lessons in history and patriotism, as well as positive messages regarding self-confidence, friendships, and faith. I look forward to more exciting stories in this series of books that empower kids and encourage them to think of the special gifts, talents, and interests they all possess. When John Jenkins’ parents ship him off to stay with his aunt, he’s certain it will be the worst summer ever—until he learns he’s been accepted into a top-secret school. St. Michael’s Academy is home to gifted students with extraordinary talents. Although John has no idea why he’s there, he’s assigned to Team Liberty, who assist authorities with solving low-level crimes. Their first mission: stop a trio of mischief-making teens from vandalizing Mount Rushmore. 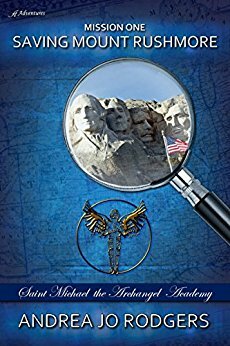 John battles feelings of inferiority as he and Team Liberty compete against Devlin Black and his cronies to track down clues and solve puzzles at Mount Rushmore. Along the way, John makes several key contributions, and his self-confidence grows. When he discovers he was admitted to the school due to a clerical error, he’s mortified. Now, he’s strictly an “observer” until the mission’s end. But when his teammates run into trouble, John must summon up the courage to save Mount Rushmore, and he learns an invaluable lesson: every person has special God-given gifts—including him.